Winners and losers are often separated by fractions of a second. You pull the trigger first, and you win. That's how it works when you're using Ballistix Tactical DDR4 memory. Engineered to deliver explosive speeds and lower latencies, Ballistix Tactical DDR4 is a big step up from standard gaming memory and allows you to strike first, faster, and more frequently than the opposition. Win quick draws and survive close calls with faster speeds and lower latencies. 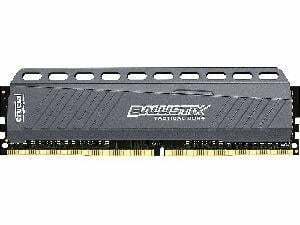 While standard PC memory often works at just DDR3-1333 MT/s, Ballistix Tactical fires at speeds up to DDR4-2666 MT/s for a massive edge in responsiveness. Overwhelm your opponents by doing more in less time. Standard PC memory is often only able to handle up to 12.3 GB/s before succumbing to bandwidth restrictions. Ballistix Tactical destroys this limitation and throttles up to 21.3 GB/s through the memory bus. Stay cool and collected with premium heat spreaders. Ballistix Tactical modules are engineered to maximize heat dissipation, allowing you to play longer and harder — and look good doing it. Ballistix Tactical modules also include certified Intel® XMP 2.0 profiles for easy setup and configuration.